It is this sticker that I saw on my walk home that led to this post. If I was behind a car on a hill and it started rolling, I might get mad or honk. But with this sign (Kid Driver Manual), I know it’s a young person who is learning and I’ll be more patient. This sign reminds us to cut this kid driver some slack; have a little patience and understanding (something I struggle with behind the wheel sometimes). Of course it made me think of kids learning to eat. 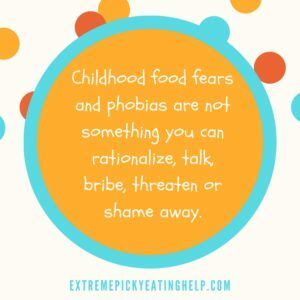 Imagine the child with extreme picky eating who only takes crackers at a party, and how us adults could all do well to remember to cut him some slack, that it’s not our job as outsiders (or parents) to make him get over his fears on our time-table (and we don’t know his history). Wouldn’t a sign make it simpler? “Kid Learning to Eat. Back Off. It’s Not Your Job to Make Me Eat.” We shouldn’t have to make signs. I can dream about a world where the reaction to a tantrum at the grocery store, a child refusing to eat an offered food, or a child reluctant to swim at the beach, was patience, openness and kindness instead of judgment and interference. To the parents of children with extreme picky eating: does the dog fear scenario sound familiar? Do others try to convince you and your child that her food fears are ‘silly’, or she would ‘like carrots if she just tried them?’ Does it help? Does it make you mad? How does your child react? You never know when or what might happen that helps your child get over her fears or resistance. Dog fear update. At about age 6, we were at a local mall and there were some very old therapy dogs laying on the ground as part of a fundraiser. Other kids were petting the dogs. M walked up to them holding my hand and watched for awhile. Then she squatted down and started petting one grizzled, three-legged dog. From then on, I noted an increasing willingness to approach dogs, which gradually turned into petting them, at first with my attendance, and then on her own. I made few comments, and let her run the show. Now at age 8, we own a dog, and I was amazed the other day at a local dog park when a Great Dane bounded up to us and she laughed and petted his head (almost at the same level as hers). How far we have come.